On Wednesday 8 August 2018, Tony Buller led a party along Dawlish seafront to learn about: (a) the transformation of the town from a medieval agricultural community to a fashionable watering place and then to a modern seaside resort; (b) its geological setting between majestic red cliffs; and (c) the damage inflicted upon the seafront railway during extreme weather conditions in early 2014. A defining moment in the development of Dawlish was in 1807 when John Edye Manning purchased much of the town centre and most of the marshy, tidal outlet of Dawlish Water. His aim was to enhance the look of the town, to extend housing closer to the sea, and to reclaim the ‘wasteland’. He quickly embarked on straightening the water course, constructing embankments, draining the marshes, and raising the overall ground level using spoil from his house building activities. The result was an elegant tongue of parkland fit for a watering place, which is known to this day as The Lawn. A second defining moment was when Brunel decided to route his Atmospheric Railway across the entire seafront in 1846. The embankment and the viaduct over Dawlish Water were built on a shingle ridge to the detriment of the fishermen, and the later seawall, completed in 1902 (King’s Walk), consumed even more of the beach. Not only was the area of the beach severely reduced, but some of the remaining sand was removed by waves because the lower part of the seawall is below the high water mark, resulting in backwash scouring. The thickness of the beach is also much reduced. Coryton’s Cove: thick, honey-comb weathered dune sandstones underlain by thinner-bedded sheet flood breccias. At Coryton’s Cove, participants were introduced to the geology of the Permian cliffs whose sediments were deposited when Devon was subject to a semi-arid desert environment. The cliffs contain examples of desert plain sheet-flood sandy breccias* and sizeable dune sandstones whose surfaces display distinctive honeycomb weathering. 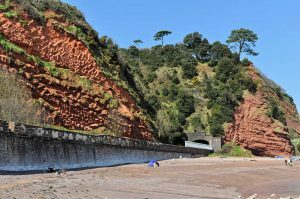 Vertical sand dykes adjacent to Kennaway Tunnel may have resulted from earth tremors. In early 2014, huge storm waves crashed against the seafront railway and mainline station, excavating a 100m-long washout crater which threatened houses along Riviera Terrace, removed much of the road, and left the rails dangling in mid-air. This story generated headlines across the world, including the first episode of the British Channel 5 documentary series – The Railway: First Great Western. Working in appalling conditions in the shelter of welded containers, a team of 300 engineers battled day and night to repair the breach by Easter. Final restoration work started in September 2014, and continued into 2015 when the newly restored sea wall was strengthened by building an additional wall in front of it. 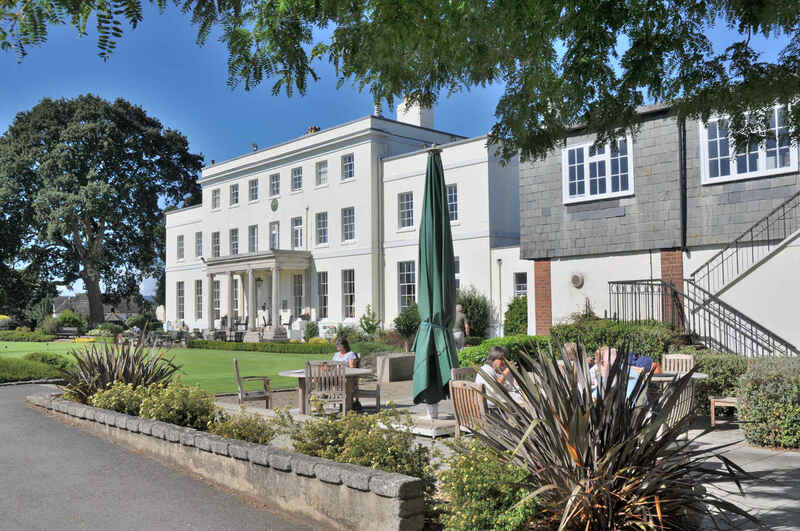 On Wednesday 19 September, our traditional Annual Lunch was held at the Exeter & Country Club, where DA President Dame Suzi Leather was guest-of-honour. She told us that she was born in Kampala, but came to Devon when she was 6 years old and attended St Mary’s School, Calne and Tavistock School. Later she gained a BA (Hons) in Politics from the University of Exeter in 1977, followed by a BPhil degree in social work. She then went on to Leicester University gaining a MA degree in European politics in 1978. Among a host of other commitments, she is currently an ombudsman for higher education students, dealing with complaints as they arise. Her talk was partly based on her Presidential Address – Exploring Devon’s Social Landscape – at the 2018 DA Dartmouth Conference. Devon has a relatively stable, ethnically homogenous population which is predicted to increase by 15% by 2033. A direct result of this will be a very large number of people over 60 years old, with a particularly striking increase in the number of over 85s. With one in three developing health problems, as well as challenges brought about by isolation and a loss of close social networks, one can no longer rely on the authorities alone to provide the necessary support, especially in the face of increasing personal debt and public sector financial austerity and cuts. The answer must lie in developing an even stronger civil society somewhat reminiscent of a bygone age but tailored to the social landscape of the 21st century. Already Devon does twice as much volunteering as elsewhere in Britain and has the highest percentage of neighbourliness – about one third of our people are willing to help non-family members. Nevertheless, this praiseworthy charitable status needs to be taken to a much higher level if we are to avoid widespread suffering. In this general context, she praised the role of the Devonshire Association in providing an important vehicle for social connectedness as well as continued intellectual stimulus. 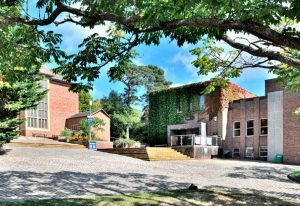 Our Annual General Meeting at the Mint Methodist Church on Wednesday 7 November was followed by a talk on The Significance of Devon Church Interiors by DA Registrar, Dr Bridget Gillard. She systematically summarised the characteristics of the churches and their commonalities throughout the ages, starting with the pre-Norman Period of which little remains. A few early Norman constructions with their characteristic square towers are still in existence (e.g. St Olave’s church in Exeter), and over one hundred fonts have survived as a tribute to the craftsmen who produced them. There are also some remnants of decorative doorway surrounds. Next came the Early English Gothic Period (1170–1270) characterised by churches with thinner walls and pointed arches, of which there are only a few examples because the prosperity generated from farming improvements and trade did not reach the county until after the Black Death. There are some significant examples from the Decorated Gothic Period (1270–1380) that witnessed flamboyant decoration, including intricate window tracery, most notably Exeter Cathedral. This was succeeded by the Perpendicular Gothic Period (1380–1520), characterised by tall towers, carved and painted rood screens, barrel vaults with decorative wall plates and bosses, and intricately carved bench ends. The 16th century Reformation and the Civil War (1642–1651) saw a destructive reversal when much of this former glory was lost, particularly statuary, wall painting and stained glass. However, the Gothic Revival Period during the 19th century saw a return to sculptures, colour and sumptuous Victorian fittings. Indeed, many churches were rebuilt and restored in the Perpendicular style. To conclude, Dr Gillard stated that the golden ages of Devon church building and decoration were undoubtedly the Perpendicular Gothic, to which many churches are attributed, and the Victorian Gothic Revival. Today Devon boasts over 600 churches – an extraordinarily rich ecclesiastical heritage for a single English county! 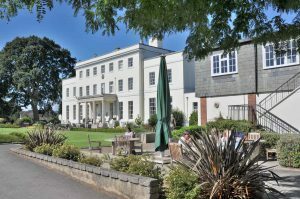 Our 2019 programme opened with our New Year Party on Wednesday 16 January held at the Devon and Exeter Institution. 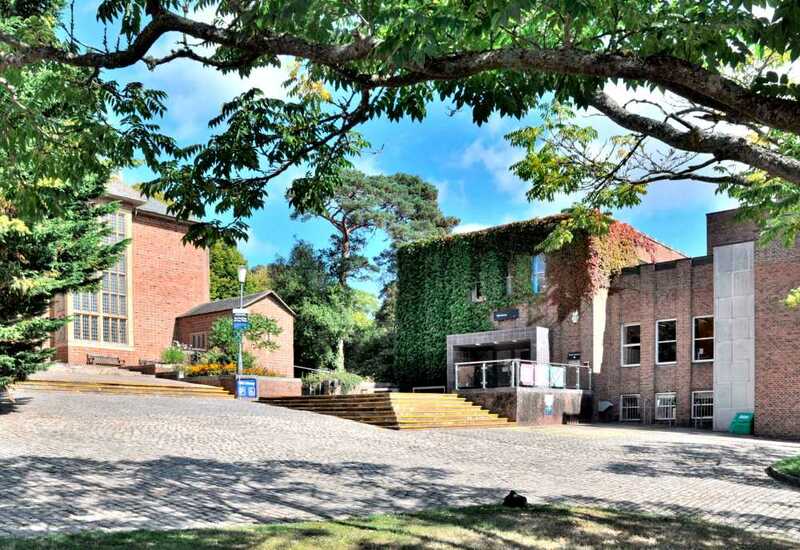 An excellent buffet supper by caterers Tea on the Green was preceded by an extremely entertaining talk by Dr Philip Wickham of Exeter University on The story of moving images and their audiences: an introduction to the Bill Douglas Cinema Museum. The museum with its research facilities is one of the foremost establishments of its type in the world. Dr Wickham began by summarising the creation, mission and content of the museum and its 80,000 or so artefacts, covering examples from the 17th century to the present day. He then led us through the history of moving images over three centuries: shadow plays in Asia using puppets; panoramas – some of foreign lands and events (e.g. the Battle of Waterloo); dioramic transformations using light to alter images from (say) winter to summer; early animated toys such as the zoetrope and praxinoscope; magic lanterns, the most important invention before films for re-creating bible stories, popular stories and comic sketches; optical toys, consisting of still images that give the impression of movement; the beginning of photography, including 3D stereoscopes; and cinematography, the beginning of moving pictures as we now know them to later cinemas which were initially very popular with women. This introduction served as a preview of a free guided tour of the museum to be led by Dr Wickham on Friday 2 October 2019. The museum is located in the Old Library near the University Chapel on the University’s main Streatham Campus, midway along the Prince of Wales Road.